I’ve wanted to visit Banff and Jasper for as long as I can remember being aware of their existence, but I was always put off by the idea that it would cost a fortune. BUT, it doesn’t. Since it’s going to depend what country you’re visiting from, the time of year you’re visiting, and how long you want to stay, this obviously isn’t going to be any kind of concrete figure. I just wanted to show that you can visit the beautiful lakes and mountains of Banff and Jasper without breaking the bank. Calgary International Airport is the closest airport serving the Banff / Jasper region, though it’s still a good 2 hour drive away. I’m flying up to Calgary from San Francisco, and managed to get a flight with West Jet for £98, though I will need to spend an extra £15-20 at check-in because you can’t pay for hold baggage in advance for some odd reason. I think that’s a fairly decent price for the length of the flight, and is probably only a little more expensive than what I’d expect to pay for the same length flight in Europe with a low-cost airline. From the UK, you can get direct return flights to Calgary from London with AirTransat for less than £400 (dates used were 09/09 –> 17/09, but similar prices are available in other months if you do your research). Of course, prices are going to vary depending on the time of year; in the height of summer the area is popular for hiking and outdoor activities, while the winter attracts lovers of snowsport. After doing a bit of research on Skyscanner, the cheapest months to from the UK appear to be May, June, September, and October. Though, I didn’t think prices during the height of ski-season were that expensive really for an 11 hour flight going direct. Of course, if you already live in Canada, or the US, driving might be a more cost-effective option. Totals for transport to Calgary can be done cheapest for in the region of £100 – £500, depending from where you’re starting your journey. Chances are, you don’t want to be confined to one area because there are so many beautiful things to see and do in Banff and Jasper National Park, so you’re going to need a way to get around. There appears to be a pretty good selection of bus services operating in the region, but it depends on what you want. Being on a bus means you can’t just stop and enjoy the scenery whenever you want, but it might work out cheaper than hiring a car depending on your itinerary (especially if you have to pay a young driver surcharge). Where you want to stay – does your bus stop anywhere near your accommodation, or are you facing a walk with your baggage? What you want to do – does the bus stop near what you want to do or see? Where do any activities or tours you want to do start? Is it going to be awkward to get to and from the airport depending on your flight times? Young driver surcharge – if you’re under 25, you will need to pay a surcharge in the region of about $20-$30CAD per day. Make sure you find out if that’s included in the quote, or if you will have to pay extra at pickup. Young drivers – are you covered by loss / collision disclaimer waivers? Some rental companies (Budget are the example I’m talking about here) will include LDW/CDW in your online quote, but you won’t actually be covered by it if you read the terms and conditions. Will you be charged for taking your rental into another province? I can’t say I understand this, but some rental companies will charge you if you drive your car from Alberta into British Columbia (again, Budget, but there are others who do the same). If you don’t tell them, you risk being arrested if you’re stopped by Police as you’ll be driving the car somewhere without permission from the rental company, if the company use GPS you could face a charge when you drop the car off. In my research, I’ve found that both Hertz and Avis do not charge for driving into other provinces. Is your mileage limited? I think I only saw one example of this (and I can’t remember the company), but you’re probably not going to want to be driving on limited mileage. Who knows what wonderful place you’ll hear about and want to discover, only to be limited by your mileage. Do you have a credit card? It seems near impossible to hire a car in Canada without possessing a credit card. It’s pretty annoying because it means I’ve actually got to get one, but it’s probably not a terrible thing when traveling. I didn’t see any companies that would let me hire a car without a credit card (I could pay on debit, but they want a credit card to ‘hold’ money). Around £170-£180 with Hertz (+ around £100 for young driver surcharge + tax at pickup). That’s probably going to bring it to a little over £300 for drivers 25 and under, and under £200 for drivers over 25 years old. This isn’t any kind of sponsored post, I just chose Hertz because they seem to be the best at giving you all the costs up front, are young driver friendly, and don’t charge for driving out of province. On top of renting a car and the fuel, you will also need to purchase park passes if you will be stopping off and visiting any of the national parks (Banff, Jasper, Yoho, Kootenay). It is a little confusing as you have to display the pass in your car, but it’s actually based on the number of people in your car – Banff and Beyond have a blog post that makes sense of this. The long and short of it is that if you are renting a car, you will need to purchase a park pass. If you’re taking public transport it will probably be included as part of the price of your ticket. The fun part! At least, it always is for me (I think I should become a travel agent if a career in science fails). As with most destinations, accommodation prices can go from one extreme to the other in Banff and Jasper. You can camp, stay in hostels, there’s Air BnB, low price hotels, nice comfy mid-range hotels, or extremely gorgeous and expensive hotels. What you’re willing to sacrifice for a ‘cheap’ stay is something you need to be honest with yourself about. There are plentiful hostels in the region that have good reviews and you can get a bed for $30CAD / £16 a night in a dorm, but is that something you’d be happy with? And what about hostels where there’s no showers? Is a shower a must-have, or are you happy to splash about on the edge of a river (where it’s safe of course). Could you sleep in a room full of other people? Though, if you’d prefer your own space, some hostels do have private rooms or family rooms, but they will be more expensive. Do you want a private bathroom? Would you prefer to stay somewhere with a cafeteria or restaurant, or do you want to make your own food? Are you cool with a private room in someone’s house, where you can get to know the locals and put their knowledge to good use? Are you looking for somewhere ‘out in the wild’ where you can pretend to be an explorer, or do you want to be in a town? Do you basically somewhere clean to rest your head after a hard day’s exploring, or do you want something more? You need to be honest with yourself and really question what you need from accommodation, because there’s no point you booking a hostel but hating it because it’s not you at all when you get there. Hostelling International Canada has a great website that makes it easy for you to find a hostel in the area you want. They’ve got loads of hostels in Alberta and British Columbia that range from $16CAD / £9 per night up to $161CAD / £89 per night. They also seem to have a fairly good range of hostels in terms of facilities. For example, the Lake Louise Alpine Centre has a cafeteria, running water and is a bit more like a hotel. While they have a series of Wilderness Hostels, which are much more rustic – but you get a gorgeous view for your sacrifices. On average, you’re probably looking around $25-$30CAD / £14-£17 per night for a hostel. There’s a good selection of properties on AirBnb ranging from shared rooms, private rooms, to being able to rent the entire place out. There are some really interesting looking places to stay as well from off-grid cabins, teepees, old RVs, beautiful looking houses; there’s something for everyone. I think the average rooms on offer on AirBnB were probably within the £60-80 region per night, though you could spend less and you could also spend a lot more. For the most part, hotels in the Banff / Jasper region aren’t as cheap as you’d probably hope. Sure, you can get cheap hotels, but hotels fill up fast which pushes the prices up, leaving you feel like you’re probably not getting the best value for money. At least, that’s how I felt. Your best bet for finding decent hotel rates is to use websites like Booking.com, Kayak, or TripAdvisor, where they try to find the cheapest rates and you might be able to take advantage of special offers. Booking.com is my favourite because you can reserve a room for free, change your dates (which I had to do because I got dates mixed up) for free and easily, and you can cancel up until a few days before and incur no charge. I’ve chosen to spend my first two nights in a hotel to help me acclimatise (I’m imagining driving on ‘the other side’ of the road being horrendous and will therefore need my own space), and then I’m spending five nights in three of HI Canada’s hostels. There are hotel rooms around for less than £100 a night, but you can also get something pretty good for between £100 – £150 a night. Again, you can also spend a lot more. 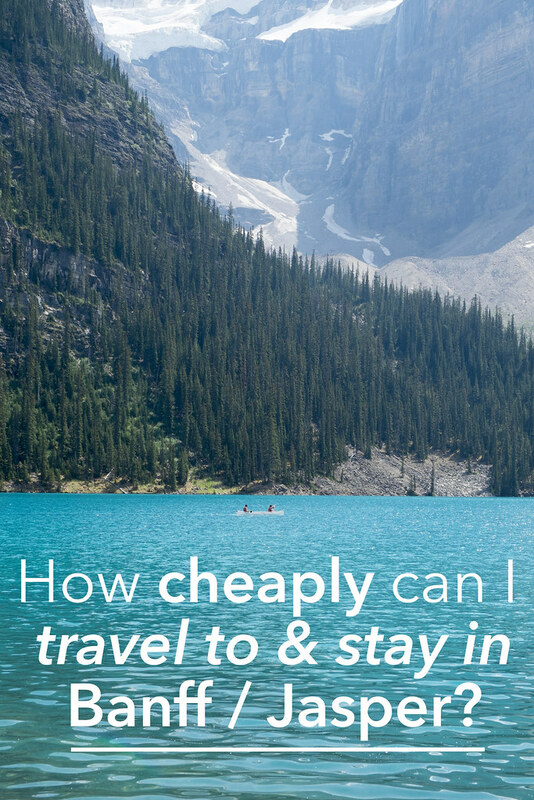 It’s hard to give a tight estimate of what you’re likely to pay to get to and stay in (excluding the cost of food, trips, etc – I’m sure that post will come when I get back) the Banff / Jasper region since it’s so dependent on where you’re starting your trip and what accommodation you’re happy with. However, I can give you my costs, though they aren’t exactly straight forward. Of course, I could have reduced my cost by at least £100 by staying in hotels for the entire seven nights, but I know myself and think I’ll need my own space to get over driving abroad for the first time. On top of that, my car hire would have cost £100 less if I wasn’t so darn youthful. Have you ever wanted to visit Canada?